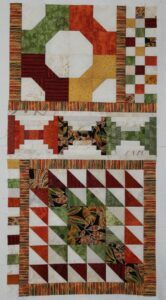 Yes, that is correct – I am one week ahead in the Long Time Gone sew-along. 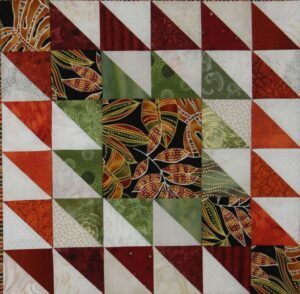 The blocks for weeks 10 & 11 are made with HST and it was a snap to cut them out using my Accuquilt Studio cutter. 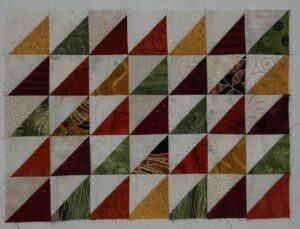 This block has such a strong diagonal that I almost replaced the focus fabric squares, but then I realized that this block will balance the Jacob’s Ladder block that has a strong diagonal in the opposite direction. 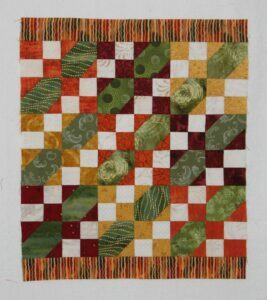 The HST block for week 11 also finished section 3 of the quilt top. I have a home sewing retreat planned this weekend with my middle daughter. She wants to sew two pairs of jeans, two shirts and one dress. My goal is to piece the next HST block, all the pineapple blocks and the remaining checkerboards. I wonder what my design wall will look like on Monday!